In ‘Steppes To Wembley’ Trautmann recorded his reactions [at Wembley] “We had to fight our way to the dressing room past people we knew, past people we had never seen before and whom probably would never see again and past people who, even at this late hour, had loitered in a strategic position hoping one of the players might have a spare ticket! We relaxed as best we could in the dressing room, some of us making an effort at singing, others reading telegrams and letters of good wishes, some of them from players and supporters of the clubs we knocked out of the Cup. … I must admit we didn’t see a great deal of each other during those last few minutes before we left the dressing room. We were too busy dashing to and from the toilets. The players were evacuating their bowels with startling dashes to the stalls and Ken Barnes Remarked “It was like we were releasing flocks of starlings from our over active stomachs”. The players were used to their own large stadium at Maine Road, but the spacial elegance of Wembley was overwhelming. The huge concrete tunnel and the seemingly vast distance from the dressing room to the pitch was daunting. The dressing rooms themselves were enormous, hugely spacious with high and expansive windows. During the pre-match preperations, Wembley officials were constantly darting in and out with last minute reminders of the etiquette required when presented to the Duke of Edinburgh, how to address the Queen during the medal presentation, while all the time the team were trying to adjust their minds to the game. The finalist’s shirts were provided by Humphrey Brothers under the brand name Umbro, who were based in Wilmslow just outside Manchester. 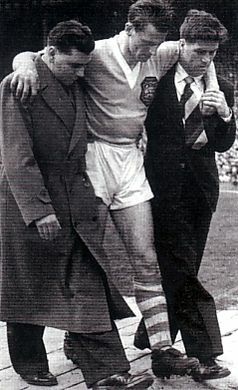 The superstitious among the players took it as a portent that they were a local firm, almost on Maine Road’s doorstep. 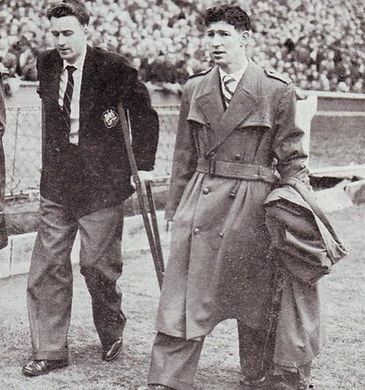 Umbro had also provided them with track suits and McDowall, who was influenced by the continental style, decided that his players should wear them. 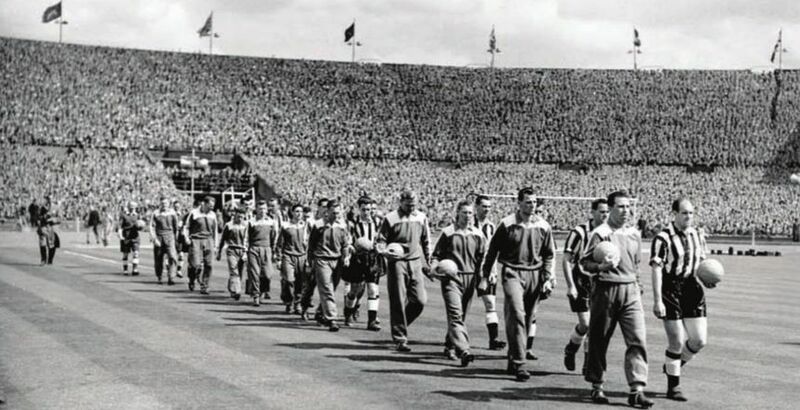 When the Manchester city and Newcastle United players lined up in the cavernous tunnel, City would be the first team to wear track suits in a final as they took to the field. The pressure on City was further increased when the bookmakers had made them 7/4 favourites to win. Trautmann found himself lined with the superb Jackie Milburn, fourth in line behind the respective captains, Paul and Jimmy Scoular. Trautmann was shivering and asked Milburn if he felt cold, Milburn replied “I’ve been here before Bert, you will be fine once we get going”. Trautmann’s sudden realisation that the Newcastle players had such a vast experience at Wembley gave him further shudders. The noise as they entered the field was staggering. The Daily Express provided the supporters with song sheets while on a rostrum, dressed in his white suit, Arthur Caiger conducted the band of the Coldstream Guards in the pre-match entertainment of awful community singing. The Newcastle supporters had deafened the stadium with Blaydon Races before the Mancunians were allowed to sing Lassie From Lancashire. The tear inducing Abide With Me was sung prior to the teams walking into view. The emotive sentiments of the hymn moved Trautmann to say “There was a sudden hush, the working people of England were on common ground with Royalty. What does it matter if they were off key or not sure of the words (Many Couldn’t read the song sheet) no Cup Final then was complete without it”. At the end of the spine tingling emotion of the song, the teams entered the huge bowl of a stadium. 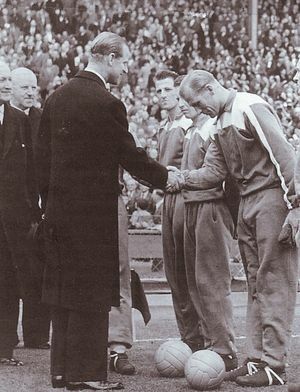 Roy Paul introduced Trautmann as the first German player to appear in a Cup Final as Bert bowed to receive the royal handshake, “Sehr gut” acknowledged the Duke. 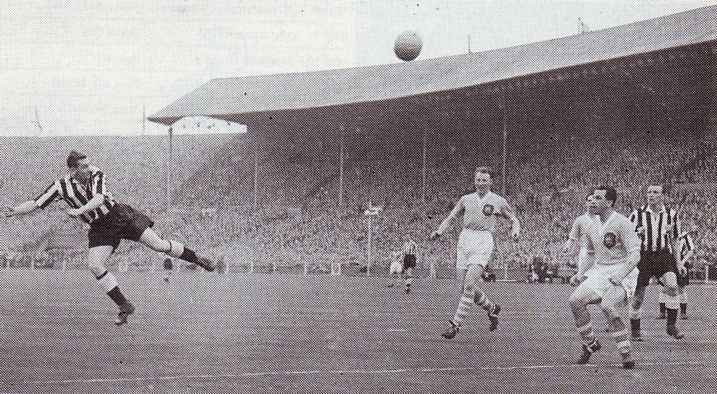 Within a minute of the game starting, Trautmann’s net bulged as Jackie Milburn headed in from a Len White corner. Roy Little covering on the line tried to head it out, his back arching like a dolphin doing a flip. 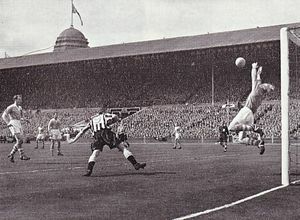 Trautmann was rooted to the spot and Newcastle supporters and players celebrated their early lead. With the impetus of that early goal, Newcastle were relentless in their pressure and Trautmann’s agility prevented them from increasing the lead. 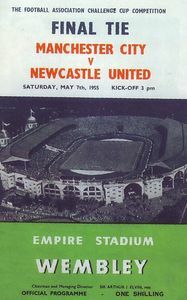 The team tactics of attacking from the moment that referee Reg Leafe blew his whistle were decimated by Newcastle’s early goal and the City players, unable to play their normal game as Wembley nerves affected each and everyone of them, even the internationals among them, including Paul, Revie, Meadows, Johnstone and Fagan, most of whom had played at Wembley before, could not get going.